Whether you’re a weekend warrior, active professional, stay at home parent or simply live with everyday stiffness or soreness, Skyline Physical Medicine & Rehabilitation can get you back to peak performance. We’re focused on the needs of performance driven individuals who demand the very best care and expertise as a part of their highly active life. Our brand new, modern facility in Lower Manhattan offers the latest advancements in diagnostics and treatments allowing individuals to live their lives pain-free. Our welcoming, friendly environment allows our staff to listen to each patient, get to know you as a person, and develop a plan that allows for a healthy well-being. From everyday aches and pains, serious injuries to post-surgical recovery; our team is here to help you heal and regain your active lifestyle. Dr. Michael Monfett is Board Certified in Physiatry with fellowship training in interventional spine, sports medicine, musculoskeletal medicine, musculoskeletal ultrasound, and electrodiagnostic studies. 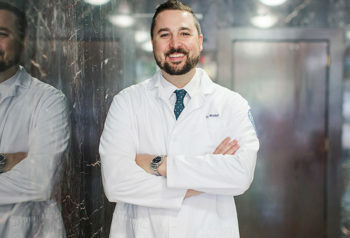 He completed his fellowship training at Hospital for Special Surgery in New York and has served as a team physician for a variety of men’s and women’s university and high school sports programs. He completed his Physical Medicine and Rehabilitation residency at Kessler Institute for Rehabilitation/Rutgers-New Jersey Medical School, Newark, NJ, and also studied at Mt. Sinai School of Medicine in affiliation with Jersey City Medical Center, Jersey City, NJ. Dr. Monfett received his medical degree from Saint George’s University School of Medicine and his undergraduate degree from Brown University, Providence, RI, where he was Captain of the men’s lacrosse team. Juvy L. Caballes, PT, DPT, LSVT, is a seasoned therapist with over 14 years of therapy experience across inpatient, outpatient, sub acute, and home settings. Juvy has worked extensively with private and commercial patients as well as with auto accident and work-injury patients, including those recovering from surgery. She is expert in the therapeutic treatment for a wide range of acute and chronic musculoskeletal conditions. Juvy earned her Doctor of Physical Therapy from Stony Brook University in Stony Brook, NY and her Bachelor of Science from Cebu Doctors’ College. Putting up with Pain? Don’t. Contact Skyline Physical Medicine & Rehabilitation today to Request a Consultation and live your best life – at peak performance.